Today we have the lovely Michelle from Ehmkay Nails. Hi All! I am so honored to be apart of The Crumpet's 12 Blogger Days of Christmas. I'm a relatively new blog on the block, so this is exciting! Nail art is what got me into polish two years ago and I love any excuse to sit down and do some art. Recently, my Red Dog Designs order came in and this particular glitter is now in my top ten FAVORITE glitters (and I have A LOT of glitter). I first used a base of two coats of Pomegranate Lacquer Beach House, a gorgeous blue shimmer. Then I added one coat of the amazing Mele Kalikimaka. 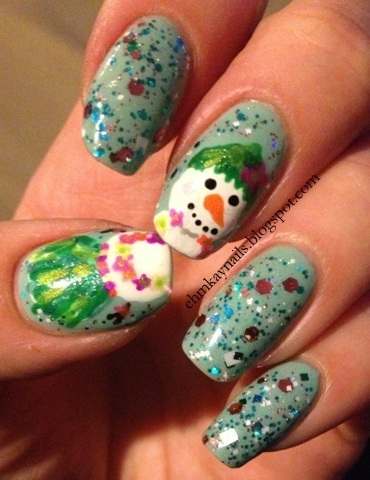 It is a mix of teal, green, pink, and white glitter, but it is so complex! Because Mele Kalikimaka is a Hawaiian Christmas song, I chose to paint a hula dancing snowman, with a grass skirt, lei necklace, and even flushed cheeks. I seriously did not want to take this off. I loved wearing this! I decided to keep my right hand with the glitter only...it was just so beautiful. Find me on Facebook at Ehmkay Nails or my blog, Ehmkay Nails. I hope everyone is celebrating their respective holiday with family, love, and of course, lots of polish. And thanks for having me Debbie! OMG how awesome is it having guest bloggers ?? 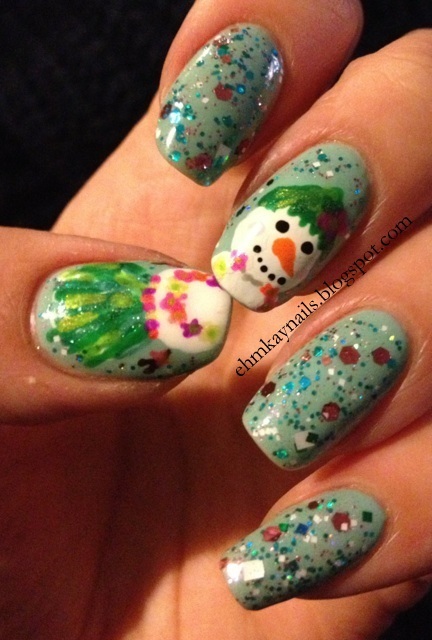 I can tell you (to my shame) I would have NEVER thought to do a hula dancing Snowman lol. LOVE HIM !!! Thanks Michelle.